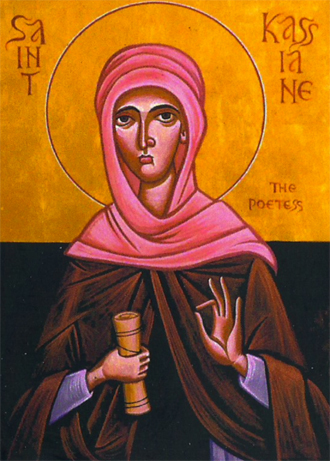 Kassiani (also known as Kassia) was a ninth-century abbess and composer born in Constantinople around 810 AD. And her music is very beautiful. She was one of the first composers – and is the earliest female composer whose music has survived to the present day.Around 25 of her pieces survive, along with a wealth of verses and epigrams. She was famous in her own day, partly because of legendary story of her encounter with the emperor Theophilus. The Orthodox wiki tells us more. I hate the rich man moaning as if he were poor. “Through a woman [came forth] the baser [things]”, referring to the sin and suffering coming as a result of Eve’s transgression. Kassia promptly responded by saying: “And through a woman [came forth] the better [things]”, referring to the hope of salvation resulting from the Incarnation of Christ through the Theotokos or the Virgin Mary. His pride wounded by Kassia’s terse rebuttal, Theophilos rejected her and chose Theodora as his wife. The next we hear of Kassiani is that in 843 she founded a monastery in the west of Constantinople, near the Constantinian Walls, and became its first abbess. Although many scholars attribute this to bitterness at having failed to marry Theophilos and becoming Empress, a letter from Theodore the Studite indicates that she had other motivations for wanting a monastic life. It had a close relationship with the nearby monastery of Stoudios, which was to play a central role in re-editing the Byzantine liturgical books in the 9th and 10th centuries, thus ensuring the survival of her work (Kurt Sherry, p. 56). She wrote many hymns for liturgies; the most famous being the eponymous Hymn of Kassiani, sung every Holy Wednesday (liturgically; actually chanted late in the evening of Holy Tuesday). This entry was posted in Music and tagged Kassia, Saint Kassiane, Saint Kassiane the Hymnographer. Bookmark the permalink. Good article. St. Kassiani is my patron saint.